Now that my little chubber, Chatham, is 6 months(!!! 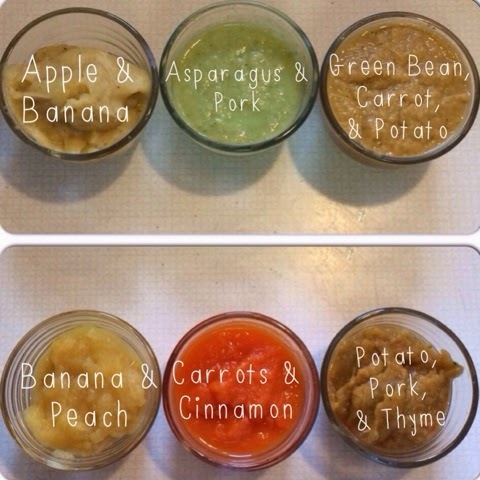 ), I thought I'd share how I make homemade baby food. I don't mind using the jarred/canned baby food, but I would prefer making it. It's just nice to know exactly what your feeding your baby as well as being able to make so many different combinations of flavors. My plan was to have Adam video me making the food, but as kids always do, Chatham had other plans for me and I ended up holding her throughout the video. 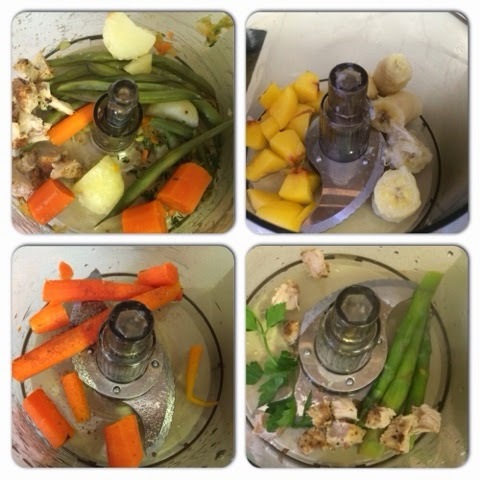 Check it out- I give you a short rundown on the products I use and how I go about making the food! 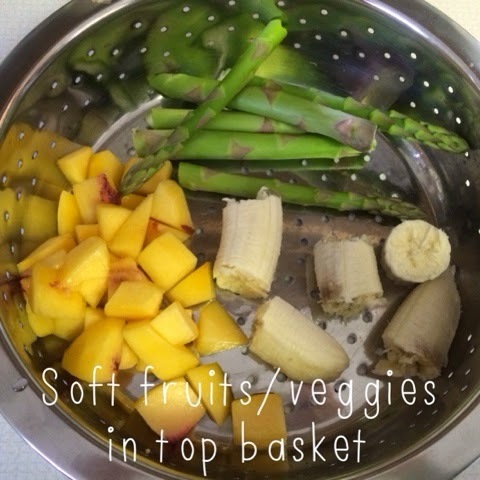 A couple things when making your own baby food- invest in a steaming basket/pot combo, invest in some type of tupperware, and set aside some time to make bigger batches- it just makes it easier. Our time is precious with babies and this makes life much easier! You can start simple, similar to stage 1 baby foods, with individual fruits and veggies. Then, when you feel comfortable, or your baby is bored with it, you can move on to some amazing combos and flavor mixing! I look to Pinterest and my favorite baby food making website, Weelicious, for inspiration! It usually takes me about 45 minutes from start to finish including prep, boiling/steaming time, food processing time, and putting all the food in jars and into the freezer. And I have about a week/week and a half worth of food. As I show you in the video, I use a double steamer. 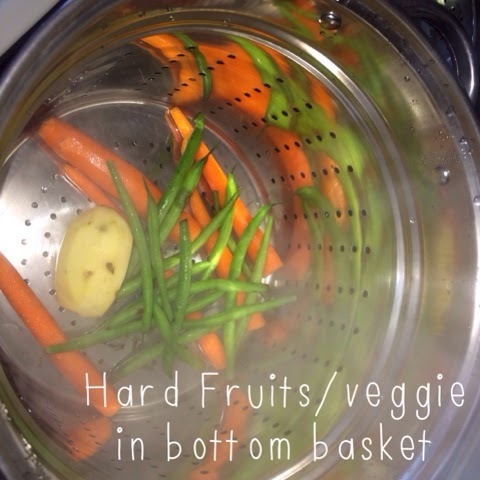 I put all the medium/hard fruits & veggies in the deeper steam basket and the soft fruits and veggies in the top steam basket. (Check out my visual below for which fruits and veggies are in which category.) This way, I'm being efficient with time by steaming them altogether, but as soon as the softer foods are done, I'm able to take them out and begin pureeing them. It's also great to throw a bunch of different fruits and veggies in because it gives you the flexibility to make so many different combos without indivually steaming each food. Check back tomorrow for some of my favorite food combos! 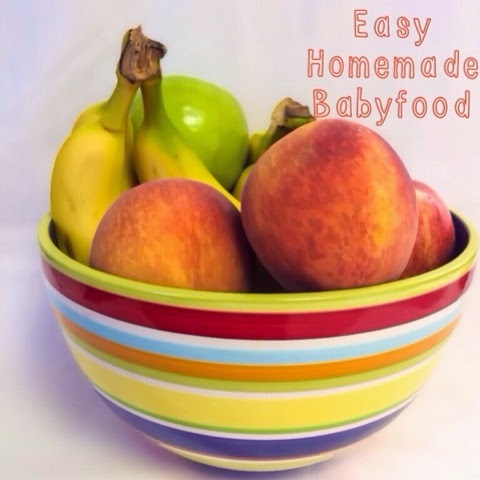 Do you make your own baby food or are you a grab it off the shelf and serve it kind of girl? Do you have any great recipes? I'd love to hear them! Love the post, very informative. Thanks for sharing! If you are planning to move home or office shifting one place to another.Then you need to hire professional hand for packing and moving, hire Dealkare movers and packers in Vasant Kunj for better shifting solution at affordable cost. Find government jobs notification, exam and result's notification at www.findsarkarijobs.com. As we all know that there are many college for BCA course in Delhi/NCR. But which is the best for you. There is only one college which is perfect for every student that is IPEM College. Here you can choose best used car as per self requirements with limited budget from many car brands, models, price and Version Company that customers can pick from anywhere. If you want to buy used cars here we offer data of good condition, examined, finest and tested used cars in Karnal city. Here you can select best facility for Packers and Movers services in Gurugram.We offer reliable, safe, secure and smooth facility for customer’s goods.